It's a chocolate Friday again - we made it through the week! First of all, I have to say that I am happy to be celebrating my 16th Wedding Anniversary today! I am so blessed to have such a wonderful husband who loves me and puts up with all my shortcomings - and he's a great father, too! He loves the Lord and strives to be an excellent head of the household. He works hard to provide for our family and is handy around the house and yard - what a combo! Happy Anniversary, honey! I love you!! ~ Huge chocolate-covered strawberries - I've had these - YUM! Have you ever tried any of these? Have you given or received a romantic chocolate gift? Let's hear your chocolate thoughts! 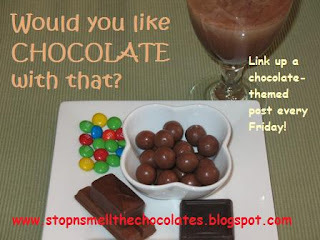 Link up your chocolate post (old or new) with Mr. Linky below. Find more info here or look at last Friday. Those all sound yummy. My brother is a Chef out at Epcot and he makes those chocolate covered strawberries and they look like they are wearing little tuxedos. He made them for us one time and they were sooooo good. They sell them for like $4.00 a piece. Crazy huh? Happy Anniversary by the way. Have a great day and celebration. My hubby's birthday is on Valentines, so I am usually the one making the romantic chocolate goodies. :) For a few years I made Chocolate dipped strawberries to place around his heart shaped cake, mmmm. No tuxedos like Kim's brother, but they were delicious! Happy anniversary!! What a joy and blessing to be married to a godly man. No, they're not perfect, but neither are we (! ), and they do work hard to be the husbands and fathers that God ordained them to be. I rejoice with you today. Chocolate sounds soooooo..... yummy right now, and I have NONE in the house! I'm going crazy!!! Happy Anniversary. It is a joy to celebrate with our families. Happy anniversary! Chocolates are unique romantic gifts.